According to Business Insider, more than two in three Americans will make an online purchase at some point in 2018. Of these online shoppers, a significant minority are making multiple purchases throughout the year. With the continued dominance and growth of Amazon, those numbers are only going to continue trending upwards. As a result, owning a website is vital for a business’ continued survival, let alone success. If you do wish to create a website for your business, or blog, you must first register a domain name. Choosing the right domain name gives your site a distinctive identity that distinguishes it from the millions of other websites already up and running since no two people can register under the same exact domain name. Now, some people have already registered a domain name, but become disgruntled because the name is not quite right. In such cases, such dissatisfied customers do have an option to transfer or change their domain name. That said, before you can begin your search for that perfect domain name, or change your current domain name, it is crucial that you first understand how domains and domain names work. Having a grasp on the ins and outs of domain names will aid you in your quest for finding the right one; one that does not require any changing. After, we will discuss why having a strong domain name is important. For those that have never owned a website, you may just automatically assume that a domain name, and a website are interchangeable words all meaning the same thing. They are distinctly different parts of the same whole, so, buying a domain name does not mean that you also have a website. There are still major differences between a website and a domain name. A website is an online storefront, similar to a physical brick and mortar store. After searching your name in a web browser, prospective shoppers enter the website, peruse the page, interact with the various features, and then possibly make a purchase, or subscribe to a service. A website is made up of various files, web pages, images, video, sound, music, and other data. Just like you would need an address to locate a physical store, a website needs a virtual web address in order to distinguish it from the millions of other online locales. When computer scientists were creating the fledgling World Wide Web, the very first computers would communicate with each other using an Internet Protocol address; 32-bit or 128-bit numbers that functioned as that computer’s virtual address. These numbers served dual purposes: locating a web address, and distinguishing and identifying web addresses. This brilliant IP system worked fairly well in a small setting between a handful of computers, but even then, keeping track of these random sequences of numbers and dots was not an easy task, especially if you wished to memorize an IP address. This would naturally become even more complicated when additional IP addresses were added to the network. As it was, scaling was an unsustainable model, much in part due to the limitations of human memory. Even creating a gigantic IP phone book of sorts would not be an efficient solution in and of itself. To remedy this issue, computer scientists created an IP registration system wherein the IP address was registered and linked to a unique name. This name functioned as a natural and easy substitute of the numerical address. Once typed in, these names would automatically translate to that IP address. Today, these virtual shortcuts are what we refer to as domain names. A top-level domain, also known as a domain name extension, is what gets typed in after the period but before the slashes. For google.com, the .com is the top-level domain. Originally designed for specific purposes, seven TLDs were created: .com, .edu, .gov, .int, .net, .mil, and .org. Although some of these TLDs maintained their rigid function, others, such as .org or .com, became widely used. These extensions opened up a vast array of possible combinations for a domain name, as you could register both business.com or business.org. Over time, even these original TLDs limited how many domain names could be created. To fix that, hundreds of new domain extensions have been added, called new top-level domains (nTLDs), as they are released. This increased the number of available names and gave businesses an opportunity to be creative or imaginative with domain endings such as the social media music site, music.ly. You don’t like your old domain name: Tastes in humor change, so your domain name may end up not as clever or funny as it previously seemed.. Industries shift. Perhaps you have a domain name that is no longer relevant or helpful in distinguishing your product in the marketplace. If you no longer like your domain name and want to change it, first think it through. Changing could mean losing traffic or search rankings that have previously built up. The domain name wasn’t gaining traction: Perhaps your domain has not accumulated the traffic or positive feedback from your customers as expected. na It has not blown up like you thought it would. Since your sunk cost is fairly low, you could change it and see if something else sticks better in the minds of your customers. Your business name changed: If you have changed the name of your company, switched industries, or pivoted the business in such a way that the name is no longer relevant or applicable, then you are practically forced to change your name. If you want your brand to succeed, you have to send a clear and consistent message to customers and the first way to do that would be changing the domain name. 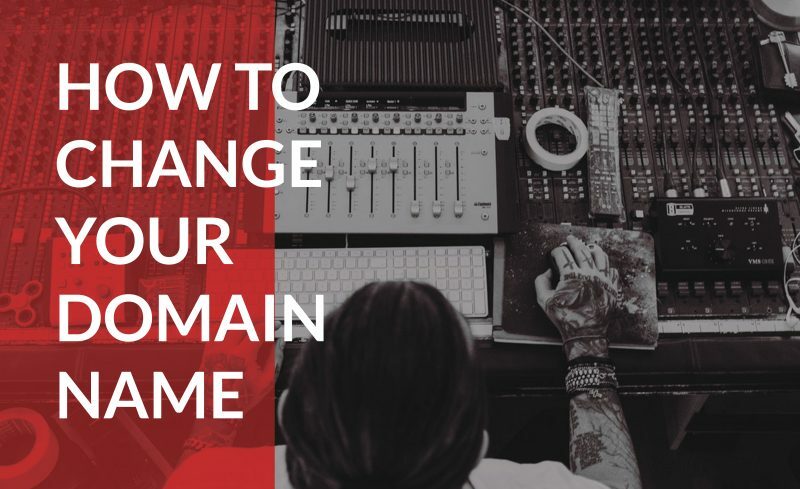 You want to change the extension: Maybe you bought a domain name with a lesser known extension because your desired one was unavailable. Perhaps you wish to get a more mainstream TLD. If that name is now available with a better extension, a domain change can be worth the price of making the switch. Log in to your Domain.com, hosting account. Go to the Domain Control Panel settings. Click on the Website Builder Icon. Right next to the Domain name you wish to change, click on Options. A menu will drop down, click on Change Domain. A popup will appear, hit choose your domain and then apply. Select the domain you would like to use for the website and then hit apply. The Website Builder editor will open up, allowing you to make revisions to the site. After making the changes in settings, hit Save and Publish your site. A popup will appear asking, “Are you sure?” Hit Yes. Congratulations you have successfully changed your domain name and your website is now live. If you are switching to a new domain, you want to make sure that you redirect visitors to your new site instead of being on your old one. In order to do that, you must setup a 301 redirect page. The purpose is to redirect search engines and site visitors to your new website so you don’t lose traffic or visibility when you make the switch. Go to the Domain settings in your cPanel. Click redirect from the sub menu. Fill in the information provided on the form. Enter in the previous address and the new address you want to redirect to. Go back to the main page and verify that your redirect page has been saved. If your site is not on Website Builder, the process will be a bit more complicated. In order to redirect your visitors without sacrificing your traffic, you will either have to bring all your files over, build a completely new site under your new domain, or do a redirect from the old domain to the new one. A domain name lends a feeling of legitimacy to a business, especially to strangers. These days, many customers will not be interested or have trouble trusting a company that does not have a website. If you have a domain and a website, you signal to people that you are serious and easy to reach. Whereas, if you utilize some free web hosting site, customers will feel wary about providing you with their credit card or personal information. The domain and the website function together as an initial screening filter for customers. A relevant domain name will likely pique a customer’s interest, while an irrelevant domain name could be a turnoff. For example, if someone is looking for winter gear, a domain name of supplystore.com might be less effective than a domain name that has relevant keywords in the name, like wintergear.com. If you register a domain name that pairs with whatever good or service you are selling, you are far more likely to draw in people who were browsing or simply typing in general keywords. Just like how an attractive storefront will draw in a passerby, a relevant domain name will similarly land virtual web surfers. Although the domain name is not available, if you were selling cars, no name would be more ideal than cars.com, since that is the most likely thing to be typed in by someone who wants a car, but doesn’t know where to begin their search. If you have a physical location where you do the majority of your selling, having a domain and website is important since it gives you an alternative revenue route. This makes it simple and convenient for loyal customers to continue buying your goods or services, and as mentioned, brings in alternative customers who might never hear of or walk by your physical store. Diversifying your revenue streams gives you an opportunity to continue to grow your business. In the past, moving locations could ruin a successful business, even if it meant only moving a few blocks away, since people had associated that physical location with your business. Such a move became even more damaging when moving a considerable distance, since you would effectively lose all the years building up your business reputation at that location. Now, when you own a domain name, you can change offices, leave the state, or even the country, and that domain name will follow wherever you go. This allows you to keep customers even if you now live thousands of miles away. Similar to establishing credibility, owning a domain signals to potential customers that you’re a forward thinker. You have not only adapted to the digital age, but embraced it. It implicitly tells customers that you welcome technological progress and are savvy enough to use such change to your business’ advantage. Imagine a computer repair store that didn’t have a domain name (the irony!). Whether true or not, a customer might think that the company without a domain and website may be selling a product or service that is out of date. Having a domain name is important if you want to establish credibility with customers in the online space. It’s an easy way to signal to shoppers what you’re selling and to gain a foothold in the online market. The edge you gain through landing that perfect domain name is well worth the time and money investments required. Unfortunately, some people wind up with a domain name that accomplishes none of those things. As a result, they are forced to change the name. Fortunately, this process is simple: follow the steps listed above and your website will be up and running in no time.